The French bulldog: easy to potty train. Potty-training is frustrating for all dog owners. Accidents are expected, especially for puppies. Luckily, the French bulldog is a clean breed that avoids accidents, so consistent training will have yours eliminating solely outside in a matter of weeks. Create a schedule with regular eating and potty times. The Humane Society recommends taking your dog outside immediately after waking up, after playing and after eating or drinking. Remove food between meals so your dog knows to eat when food is available. Remove your dog's water dish at least two hours before bedtime. Confine your frenchie if you can't provide supervision. Limit your dog to a crate or small blocked-off area. 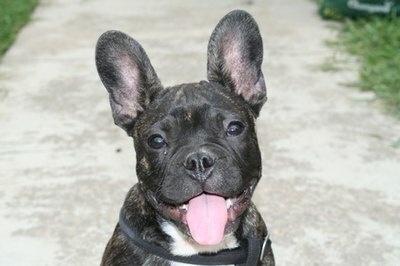 Frenchies are a clean breed and will avoid eliminating in their sleeping area. Puppies under 12 weeks old do not have complete bladder control and can hold waste only for the same number of hours as his age in months plus 1, according to the ASPCA. Watch for warning signs that your French bulldog needs to potty. Warning signs include circling the room, pacing from room to room, sniffing, whining, barking or simply staring. If you see these warning signs, immediately take your frenchie outside to eliminate. Teach the “go potty” command. As soon as your French bulldog starts eliminating, say “go potty” and once he finishes, praise him with a treat while still outside. Wait until the dog is completely finished or he may finish in the house. Before long, you'll say, “go potty,” and your dog will know what's expected before he starts eliminating. Clean indoor accidents thoroughly to eliminate urine and feces odors. If your dog smells waste in the house, he is likely to frequent this spot to go potty. If your frenchie poops in the home, place the feces in the appropriate area of the yard so your dog smells it next time he goes outside. Take your dog outside on a leash and bring him to the same spot every time. This helps your frenchie become aware of approved potty areas. If your dog enjoys the outdoors, do not bring him in immediately after eliminating or he may learn to hold it so he can stay outside longer, according to ASPCA. Note the times your dog uses the potty to determine your dog's natural schedule. Reward your dog with praise, petting and toys instead of always using treats. This way your dog doesn't always expect a treat and become discouraged with potty training if a treat is not available. If you work outside the home, hire a pet sitter or neighbor to take your dog outside. If your frenchie is a puppy, take your dog outside at least every two hours. Never scold, physically punish or rub your dog's nose in his waste. These behaviors scare your dog and discourage the potty training process. In addition, punishment techniques can cause your frenchie to become aggressive. If your dog has an accident, it is the owner's fault due to inadequate supervision, ignoring signals and not taking the dog outside enough, according to ASPCA. Avoid cleaners containing ammonia since urine has ammonia. If your frenchie smells this cleaner, he is likely to repeatedly eliminate in the same spot. Clean with an enzymatic cleaner. Teaching your dog to eliminate inside on newspaper prolongs the potty training process.